A couple points about Turkey, first from Monty L. Donohew at American Thinker. When there is war, conflict, or instability, vulnerable capital and wealth also flee. The “problem” of fleeing capital is different, however. Because capital and wealth are not as encumbered and physically restricted as are human beings, especially in the modern electronic age, capital moves far from the source of instability. Capital flight makes support of human refugees even more difficult, as capital often flees nations burdened with the obligation of support, nations in close proximity to the underlying cause of flight. Unlike human refugees, who consume resources and capital, fleeing capital is welcome with inviting arms by safe havens. Capital and wealth must “go somewhere,” and if they land in the banks and markets of a particular nation, that nation reaps the reward of that investment. Pretty much common sense to my mind, although it is anything but common these days. And who is the strongest of all these days? I’d be inclined to say the United States, and it has the other advantages of being a known safe haven for money and people, with perhaps the strongest rule of law tradition in the world, the largest and most active markets, and by far, the strongest military (which it is strengthening) to back it all up. Think some Turks (and Iranians, for that matter) are looking to get themselves and their money into America. Yep. Me too. And that also strengthens America, and against all comers. Consider the many causes of the flight of capital in recent years. Are competing markets as strong and stable as they were seven years ago, and more importantly, are they as strong and stable as is the U.S. market? Capital is fleeing Canada. Capital is fleeing China (strange — people who command wealth get a bit skittish when several hundreds of their kind simply disappear). EU instability has caused capital to flee Europe (link behind subscription wall). Capital has flown from India. Capital has flown from Russia, although early indications are that new Trump sanctions may not encourage additional capital flight. Capital is fleeing Latin America. There are a multitude of examples, but the point is, too, that capital is not fleeing the U.S.
And this may well be where the conventional wisdom on tariffs and economics falls down, not my field, but it sounds rational, and people with money are usually somewhat rational. Jed Babbin writing in The American Spectator also had a few things to say about the Sick Thug of Europe. It [The Wall Street Journal] wonders why the United States, which usually intervenes to calm global markets, isn’t doing so to save Turkey from itself. Erdogan has already done so. His alliance with Russia and Iran to save Assad demonstrated conclusively that he is no longer America’s ally. It is entirely inconsistent with Turkey’s obligations as a NATO member. President Trump has, so far, neither knuckled under to Erdogan’s demands nor taken all of the actions that he could to force Erdogan to stop acting as our enemy. That may be changing. The Turkish economy is in shambles, almost in as bad a situation as Iran’s and Venezuela’s. 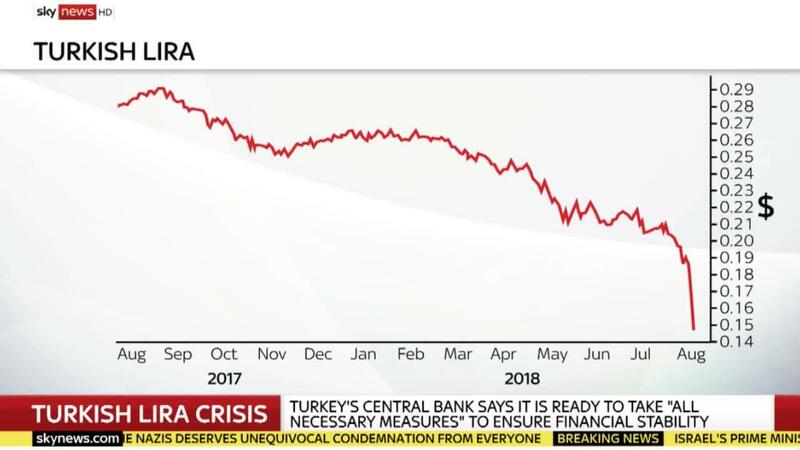 The Turkish lira fell in its value against the dollar by about forty percent earlier this year. Last week, Trump announced that he was doubling the tariffs on steel (to 50%) and aluminum (to 20%) imported from Turkey, which caused the lira to sink by another twenty percent and made international banks that hold Turkish debt very nervous. I don’t need to add too much to that although you should read all of both articles, they are excellent. But Erdogan would be well advised that one of the quickest ways to ruin a nation is to attempt to tell the United States what to do. Even King George, a quarter millennium ago, found that to be a bit more than the British Empire could accomplish. That’s a history lesson Erdogan could contemplate to the benefit of his citizens. Well good luck with Russia as your new best friend, Erdogan. Maybe this song will rekindle the memories of your past relationship with Russia and the hatred between the two countries. Indeed, a weak reed to cling to. Yeah, there isn’t much love between those two peoples. Nope, none at all as near as I can tell.